We are happy to present the newest Solar Cooker to our lineup; a compact, portable and very convenient solar panel style cooker. 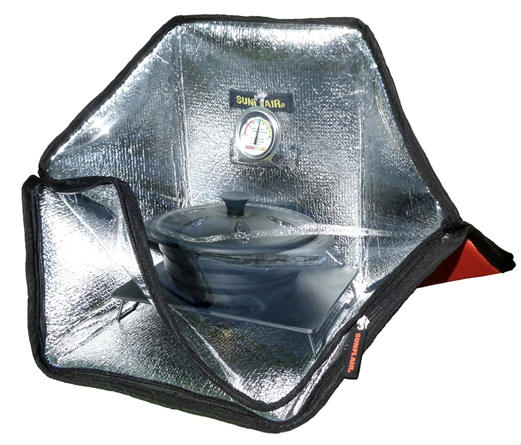 The Sunflair Solar Panel Cooker is designed for the person on the go, who needs an effective solar cooker where ever they might be. Made of weather and wear resistant materials designed to give many years of useful service. 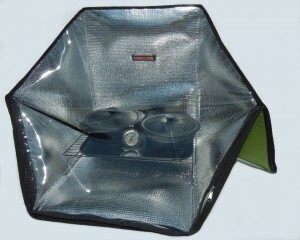 This is one of a very few compact solar cookers for Backpackers, Survivalists and for quick Emergency Preparedness situations when space is at a premium. -The reflective, or shiny, surface of the oven is made from aluminium polyethylene, commonly referred to by its brand name Mylar. (Mylar is food safe and is used much in food packaging and it tolerates temperatures up to 300 F.
-The outside fabric of the shell is polyester. -The clear, transparent cover which permits the suns rays to enter the oven, yet traps and holds the heat, is made from transparent thin PVC. 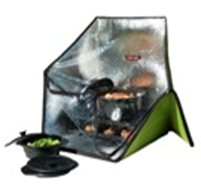 ...Don't let the looks of this solar cooker fool you, it really can cook effectively. 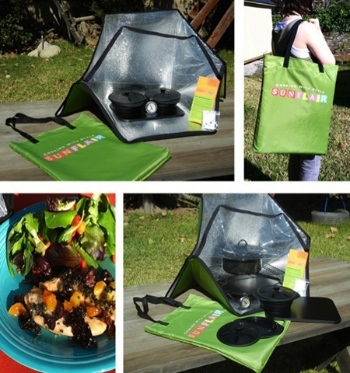 I keep a SunFlair Solar Cooker kit (with accessories) in my car for emergency and daily use. It is compact enough that I can carry it anywhere and always have it ready whether it is heating up my lunch while on the job or heating water for dehydrated soup while out hiking in the hills. This would make a great addition to anyone's 72 hour emergency kit, but I recommend also keeping it handy for everyday use. 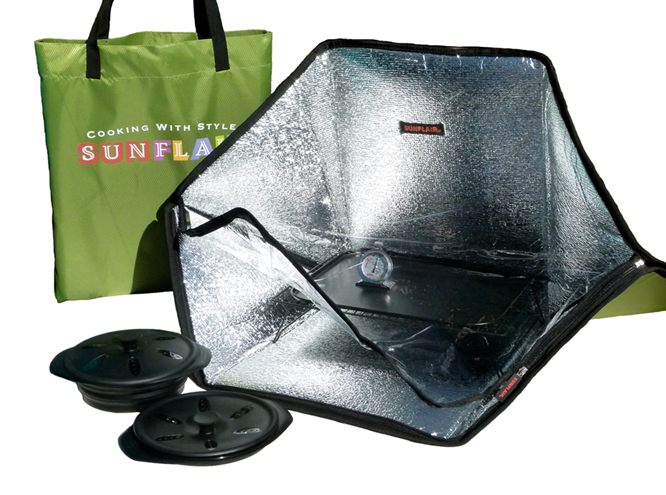 1 black metal baking sheet 14"x 10.5"
2 black metal baking sheet 14"x 10.5"
The SunFlair Solar Oven accessories are designed for compactness and easy portability within the cooker and carry bag.